One of the goals we defined during the 2013 edition of the WebKitGTK+ hackfest —among others— was enabling the Network Process, which my colleague Carlos already blogged about right after the hackfest, and with that in place, we would be then able to support having one Web Process for each WebKitWebView. Fast forward one month and a half to version 2.3.5: this is the first release of WebKitGTK+ shipping with support for the Network Process and multiple Web Processes. This feature enables applications which use multiple views to be much, much more robust. Previously, one single Web Process was shared among all the web views in an application, meaning that rogue web content could stall the Web Process —or even worse, make it crash— and all the views in the application would suddenly stop working. All of them. Translating this to a familiar use of WebKitGTK+: each tab in your favorite Web browser will be completely kaputt and rendered unusable as soon as just one of the loaded web pages causes havoc. With multiple Web Processes though, only the web view (read: browser tab) causing trouble would stop working, and the rest will keep running completely unaffected by it. We have not only enabled support for multiple processes: as a bonus, it has been made optional. That is good if your application will keep using the shared Web Process mode for all the web views: that is the default setting. Simple applications that deal with content know to be safe, like Yelp or Devhelp do not need any changes. Setting the process model must be done as early as possible in application code or, more precisely, before any other API calls that would cause a Web Process to be spawned. That is: before creating a web view and also before any other method call that would make WebKitGTK+ reach for the network. This is a hard requirement, and not doing as advised will make your application crash. You have been warned. 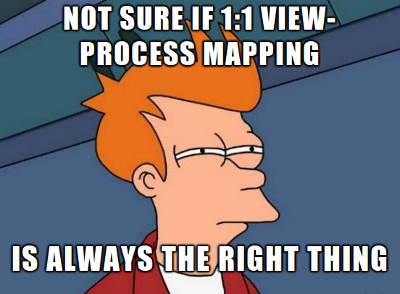 While having separate Web Processes is great and all, it is reasonable to wonder whether that should be the one and only option… Is there some mid-term approach that would be more reasonable? Moreover, how memory usage fares with the process galore we have just unleashed? Is WebKitGTK+ going to cause an involuntary DoS attack in systems with scarce memory? 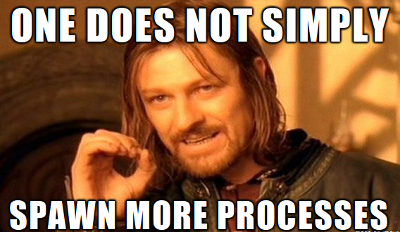 Applications may want to decide under which circumstances to create new processes. For example, a web browser could implement a mode in which each different domain is assigned a Web Process, and all the views displaying content from the same domain use the same process. When memory goes low, it would be interesting to make web views start sharing processes, to try to make better use the memory. While this does not directly solve the case in which WebKitGTK+ limits by itself the amount of processes being used —which is a feature that may be in an upcoming release—, it covers the most interesting use case without breaking the API: once again, existing applications wanting to stay in the single process world do not need any changes to their code. Unfortunately, there were some assumptions in WebKitGTK+ that no longer hold true now that it is possible to have multiple Web Processes. Even when we have tried to make as easier as possible for applications to switch to multiprocess mode, it is very likely that applications using Web Extensions will need to be updated to handle the fact that each Web Process will load and instantiate the Web Extensions. A common pattern to establish a communication channel between a Web Process and an application using WebKitGTK+ is for a Web Extension to use D-Bus to expose a known unique name, and the application waits for message bus to appear and connects to it. Unfortunately, it is no good having multiple instances of a Web Extension trying to register the same name on the bus—names are unique! One option we briefly considered was allowing to application to know the process identifier of the Web Process associated to a Web View, which would allow to use the process identifier to generate an unique name. Instead, we introduced a way to enable applications to pass arbitrary data to Web Extensions before they are initialized, and allow extensions to retrieve the data during their initialization: this way the application can generate an unique identifier, and pass it to the extensions without exposing a low-level detail like a process identifier in the public API. Plus, being allowed to pass arbitrary data is a much more generic solution, it avoids the needs for ugly hacks, and in cases where Web Extensions do not need to pass information back to the application it avoids needing to use an additional communication channel. With this final bit, there is not just a way of knowing when a Web Process is about to be spawned: the best moment to set the data for the initialization of Web Extensions is also known. 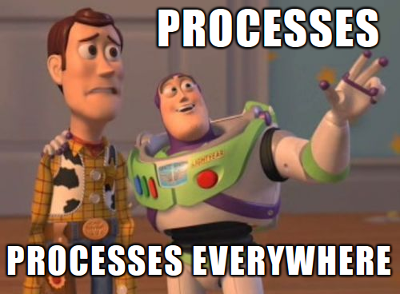 Use webkit_web_context_set_process_model() to set the process model. Use webkit_web_context_set_web_extensions_initialization_user_data() to pass arbitrary data to Web Extensions. Rename the webkit_web_extension_initialize() function in Web Extensions to webkit_web_extension_initialize_with_user_data(), in order to receive the initialization user data. Use the initialize-web-extensions signal and set the initialization user data from the callback. Last, but not least, I want to mention that all this is possible to all the restless developers who devoted time to make multiprocess in WebKitGTK+ happen after we kickstarted the work during the WebKitGTK+ hackfest.